A woman who can't remember. A man who can't forget. And a person who desperately needs to kill them both The Katy Trail is a 225-mile long biking trail from Clinton to St. Charles, Missouri. It's one of the most beautiful in the world-just the place for Samuel to get away from it all, to heal, and to quell some of the demons from his past. Into his life, however, drops Misty-a mysterious woman with amnesia, who is being chased by a shotgun-toting man intent on killing her. Samuel has no choice. His sense of honor-honed during many years as a SEAL-forces him to protect her. Thus begins one of the wildest bicycle rides in history. From Clinton to St. Charles, the two face floods, mud slides, motorcycle gangs, and vicious pool hustlers. They also experience the stunning Missouri countryside, a host of intriguing local characters, fine wines, great meals, and... love. Through it all, Samuel must get Misty to St. Charles, and help her to recall her past. But he must also solve the mystery of why the man with the shotgun is trying to kill her-and now him. It is an action-packed story that will leave you hanging right to the very end. MoBikeFed comment: Thanks to Chester in Rolla for forwarding a link to this book. State Parks is looking for your comments in support of this new trail. Forward movement on the Missouri Rock Island Trail includes more than $600,000 in pledges from organizations, municipalities and individuals. 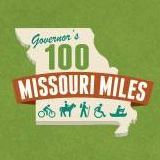 All funds are pending the Department of Natural Resources' Division of State Parks' decision to accept or deny the donation of the 144-mile abandoned stretch from Ameren. Once a railroad, the proposed trail would create a tourist destination for many Missouri communities, proponents believe. Extending from the St. Louis area, the trail would route through or near communities including Versailles, Barnett, Eldon, Eugene, Meta, Argyle, Freeburg, Belle, Bland, Canaan and Owensville. "We are massing hundreds of thousands of dollars in what we are terming non-binding pledges," said Greg Harris, executive director of Missouri Rock Island Trail Inc.
Harris said it's hard for donors to give a solid commitment when DNR hasn't committed. MoBikeFed comment: Remember that State Parks held three public meetings about the future of the Rock Island Trail in Oct-Nov 2018 and is accepting public comments until Nov 30th, 2018. Your comments to State Parks are critical for the future of this potential cross-state trail. Earlier this year several League staff members met with staff from the Insurance Institute for Highway Safety (IIHS) at the urging of Champe Burnley, the Executive Director of the Virginia Bicycle Federation, a League member organization. Champe has been involved in DriveSmartVA, a statewide group founded to reduce traffic fatalities and injuries by insurance companies. Coming out of that meeting, one of the most interesting topics we discussed was how far behind the United States was in testing new vehicles for pedestrian and bicyclist safety. In 2018, the European Union began testing new cars with Automated Emergency Braking (AEB) systems for their ability to avoid or mitigate crashes with bicyclists – but we were told that neither the IIHS nor the National Highway Traffic Safety Administration (NHTSA) were likely to have such testing for years. . . .
MoBikeFed comment: It is unfortunate that the U.S. is so behind in testing and making improvements in crash safety for people who walk and bicycle. Missouri State Parks will hold a series of three informational meetings in communities along the proposed Rock Island trail corridor including one in Owensville on Monday. The Missouri Parks Association issued an alert this week letting everyone know that attendance at these meetings (if at all possible--they are in distant locations for many Missourians) and submitting substantive written comments at the meetings or online is absolutely vital. The Eldon community is seeing a resurgence with announcements of a new factory and jobs coming to town. Now a proposed rail trail could be part of that. Superintendent of Schools Matt Davis says that proximity creates opportunities for incentive programs based on healthy activity, both by the companies and the school district, which will benefit everyone at the end of the day. But for any of that to happen, the trail has to be approved. After initially gaining support under Governor Jay Nixon, Missouri State Parks started re-evaluating the plan under Governor Greitens. Those who support the trail are encouraged to contact the state parks division and let them know. You can also attend an informational meeting planned for October 30th at 5:30 in the Morgan County Public Library in Versailles. -Meta, Thursday, November 1, 5-7.30 p.m.
Small towns across Missouri standing beside the long-disused Rock Island Railroad right of way are hoping a brighter future is coming down the corridor. Public meetings to be held later this month in Owensville, Versailles and Meta could have a major bearing on that future. The project that would convert the rail to a hiking/biking trail through a dozen small communities that were once thriving railroad towns hinges on whether Missouri State Parks will accept the gift of the old Rock Island Line from Ameren Electric. A decision to do so would clear the way for a recreational trail that advocates predict will bring thousands of tourists through towns seeking to rebuild the revenue and jobs that left when the trains stopped running three decades ago. Public meetings in three Rock Island communities will give those who support plans to develop 144 miles of recreational corridor across the state to tell State Park officials to accept the right of way and get the ball rolling. Missouri Rock Island Trail Inc. Executive Director Greg Harris says everyone who supports the trail and wants Missouri State Parks to accept the corridor should turn out and make their voices heard. “This is a critical juncture for the old Rock Island towns. State Parks must accept the corridor for them to reap the benefits of new jobs and revenue brought to town by outdoor enthusiasts, bicyclists and tourists,” Harris said. -Versailles, Tuesday, October 30, 5-7.30 p.m. The University of Missouri is honoring its Nobel Prize-winning scientist with an unusual accolade: a dedicated spot in a bicycle rack. Other schools have recognized their Nobel laureates with a dedicated parking space. But the 77-year-old Smith is, by his own assessment, "not a good driver." . . .